In the heart of the Imperial Court, Ciardis Weathervane knows that death is coming for the empire. With her friends by her side and the new triad of Weathervanes, she’s in a race against time to convince the court of the same. She must do her best to unite kith, mages, nobles and merchants under one cause – the fight to prevent a war. Soon she is forced to keep a secret that could exonerate her mother of the Empress’s death, and is always one move away from stepping into diplomatic chaos. Throw in a daemoni prince who is showing interest in the youngest Weathervane, a jealous prince heir, and a irritated dragon with her own designs on Ciardis, and you have an imperial court in turmoil. This fourth novel continues the story of Ciardis Weathervane from Sworn To Conflict. 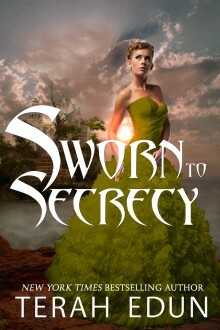 "Sworn to Secrecy is action packed and full of surprises with new villians, unexpected allies, old friends, evolving relationships...and so much more!" "Thanks Terah Edun for taking me to another reality and keeping me glued to there for hours!" "This is one series I could continue reading forever."